Our gospel reading this morning is rather out of chronological sequence: five days ago we were celebrating the birth of the Christ-child and next Sunday is the Feast of the Epiphany, as we look to the coming of the magi to worship the infant. So, jumping ahead, what are we to make of this account of the young Jesus, not quite a teenager, being lost for three days by his parents and discovered listening and questioning the teachers in the Temple? Is it just an innocuous story, the only mention in the gospels of Jesus’ life between his birth and adult ministry – a story a bit like the anecdote of David and Samantha Cameron leaving their young daughter in a Cotswold pub one Sunday lunchtime, each thinking that she was with their bodyguard? I want to suggest that these verses from Luke are really quite significant, because they challenge us to think afresh about the meaning of the Incarnation and reveal it in a quite different way. We’re so familiar with that majestic opening of John’s gospel: ‘And the Word became flesh and lived among us, and we have seen his glory, the glory as of a father’s only son, full of grace and truth’ (1: 14). Each Christmas we readily identify that Word with the frail, vulnerable child in the manger, though I suspect some carols stray pretty far from the truth – the phrase ‘no crying he makes’ comes to mind! Other verses seem to get it more right, as we sing, ‘And he feeleth for our sadness, and he shareth in our gladness’. We can identify too with the Word as the gospels recount the three tumultuous years of Jesus’ ministry of teaching and proclamation, challenging all the power structures of the world – a ministry that would lead to Calvary. But a teenage Jesus, still growing physically, emotionally and spiritually, a youngster perhaps with spots or acne – now that does challenge our imagination! Our Christian faith is not some abstract doctrine or philosophy, rather it is deeply material, earthy and fleshy, rooted in the understanding that in the personhood and life of Jesus we can perceive the essence of the loving God who has brought his creation into being. The flesh is we who are present here – infants just beginning to live, the vigorous adolescent, the old person nearing the end … The flesh is the actual human situation: human beings in sin, human beings in painful situations … The people of a nation that seems to have got into a blind alley. The flesh is all of us who live incarnate. The flesh, this frail flesh that has beginning and end, that sickens and dies, that becomes miserable or happy – that is what the Word became. The word became flesh. So in this season as we celebrate the Incarnation, Emmanuel, God with us, so we are proclaiming nothing less than that Jesus is with each one of us; whatever our age or health or situation, he is with us in total solidarity, fully identifying, experiencing and sharing in our human condition. As we celebrate the Incarnation, so we are proclaiming nothing less than that Jesus is with each one of us; whatever our age or health or situation, he is with us in total solidarity. That’s really something wonderful to hold on to. A child, still growing and with much to learn, and perhaps with a very childlike, simple faith, is just as valuable and precious in God’s sight as the fully formed, spiritually mature adult. That’s good news for Year 7s, as someone put it! Of course, we cannot keep the infant Jesus in his manger, surrounded by tinsel. He had to grow up; he had to make his own spiritual journey and discover his vocation. That verb ‘must’ is the same verb that Jesus will later use to describe to his disciples the necessity of his suffering and death. (‘Then he began to teach them that the Son of Man must undergo great suffering, and be rejected by the elders, the chief priests, and the scribes, and be killed, and after three days rise again’ – Mark 8: 31.) This necessity flows from the completeness of Jesus’ union with the will of his heavenly Father. Already, then, he is making a radical commitment, re-prioritising family relationships as secondary. We note that he remains obedient to Mary and Joseph, returning with them to Nazareth. But there’s no doubt that something profound has happened with Jesus’ growing awareness of who he is, as he puts his heavenly Father at the centre of his world and invites Mary – and no less us – to do the same. Jesus is making a radical commitment, as he puts his heavenly Father at the centre of his world and invites Mary – and no less us – to do the same. Those of us who are parents will know that raising a child involves a particular intensity of attachment, supervision and care; but as the child matures, so too as parents we have to cultivate an appropriate detachment. Our love demands a willingness to let go, to let the child make mistakes, to take those wobbling, faltering steps towards independence, to let the child’s unique character and calling emerge and develop. That’s never easy, and Mary will be sorely tested as Jesus’ calling deepens; she will experience the most agonising separation of all when she sees her son die on the cross. Perhaps as parents we’ve kept little notes or scrapbooks of the funny things that our children have come out with, which we embarrass them by recounting when they’re older. I don’t know if Mary kept any record of losing her child for three days, but we’re told she treasured all these things in her heart. I don’t think ‘treasured’ really conveys how she must have felt – surely she must have pondered and agonised over these words, perhaps recalling Simeon’s strange prophecy as he had blessed the infant Jesus in the Temple, ‘And a sword will pierce your own soul too’. Mary still had much to learn. 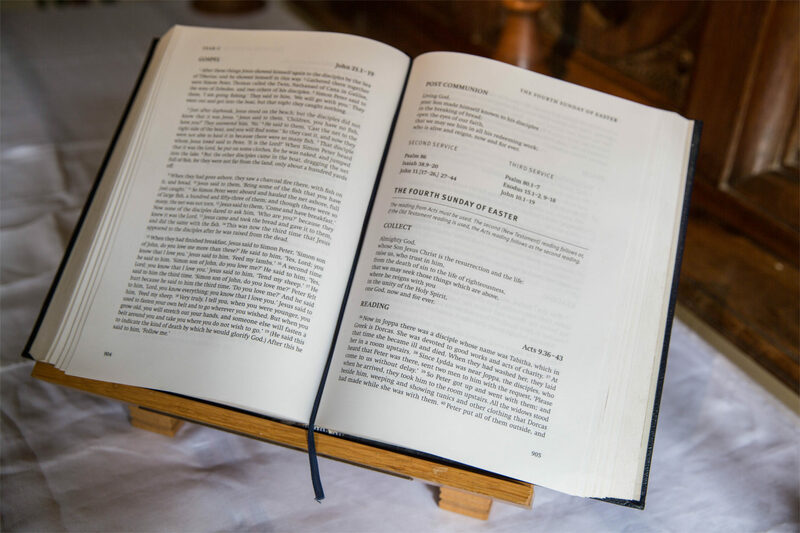 As the 12-year-old Jesus sat listening, discussing and debating with the teachers in the Temple, and then in the years following – of which the gospels are silent – so his vocation would be gradually formed. Jesus had to leave the comfort zone and the familiarity of his family and move to a bigger place with his Father. In time he would invite others to follow him – that simple invitation to Simon Peter, James and John, the fishermen beside the lake, ‘Come, follow me!’ Today, no less, he calls and invites us to leave our comfort zones, to detach ourselves from all the things that keep our lives small or our vision narrow – to follow him, to move to a bigger place, to abide in our Father’s house. May this Christmas, this Feast of the Incarnation, be a real blessing to each one of us, helping us to grow and mature in our faith, and grow in love and trust for the God who has called us into being and made each one of us his own.